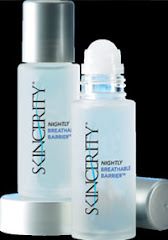 SkinCerity.....Getting In Your Business! with Brigit ........ the "SkinnyGirl": SKINCERITY TESTIMONIALS!!!! My family has sensitive skin. My daughters ages 14 & 15 have typical teenage acne and were using Proactive on their faces. My oldest was getting skin burn from using it. So we switched to the sensitive skin Proactive. This burned her skin as well. We tried SkinCerity and started seeing results within 4 days. They have not had any problems while using it. You should hear the complaints when the bottles are running out! But the biggest surprise was when my youngest started using it on her stretch marks to see what it would do. They started taking them away after a few weeks. Now it's the only thing we use next to our favorite lotions! Plus, we joined the business to help others after we exerienced SkinCerity's wonders! - Russell G.
I gave a bottle to a friend who's son has severe eczema. After one week his son's eczema has improved tremendously! - Jennifer S.
We have has success with SkinCerity with tattoo recovery. Usually the recovery process takes a week or two. We applied the SkinCerity right after the tat was finished and in about 3 days it was done recovering. No scabbing or drying out. - Jesse J.